This time we look at the world’s most famous ragtime tune, with no altered tuning, no capo and definitely no funny business. Could it be the millennium bug? The Entertainer is probably more famous as the theme tune to the movie The Sting (1974). Ironically, it wasn’t a particular success in its own time (at a time when chart success was measured only by the sales of sheet music and piano rolls). Composed by Scott Joplin (1868-1917), it was first published in 1902. In the original publication he described the tune as a ‘ragtime two-step’ which refers to the ‘cut-time’ time signature present at the beginning of the piece. Joplin was the son of an ex-slave musician and the syncopated rhythms typical of the ragtime style were likely born out of the more complex African rhythms that were familiar to America’s slave population. Syncopation involves the accenting of a note or sound that appears on the off- (also called the up-) beat. It may also involve a silence on the down-beat preceding that accent. The second and last notes of bar 5 are perfect examples of syncopation. For the syncopation to be highlighted it is usually played against a steady and regular bass rhythm. To understand syncopation more clearly, consider the phrase ‘the car sat on the mat’. The words in italics are naturally accented by native English speakers. If you instead chose to accent the ‘the’ in the phrase, you would be putting an accent (or stress) on a normally unaccented word (or beat). That’s syncopation. Very, very simple! The original publication of The Entertainer had a number of sections. For this ‘introduction to ragtime’ lesson, I have transcribed two of these sections. 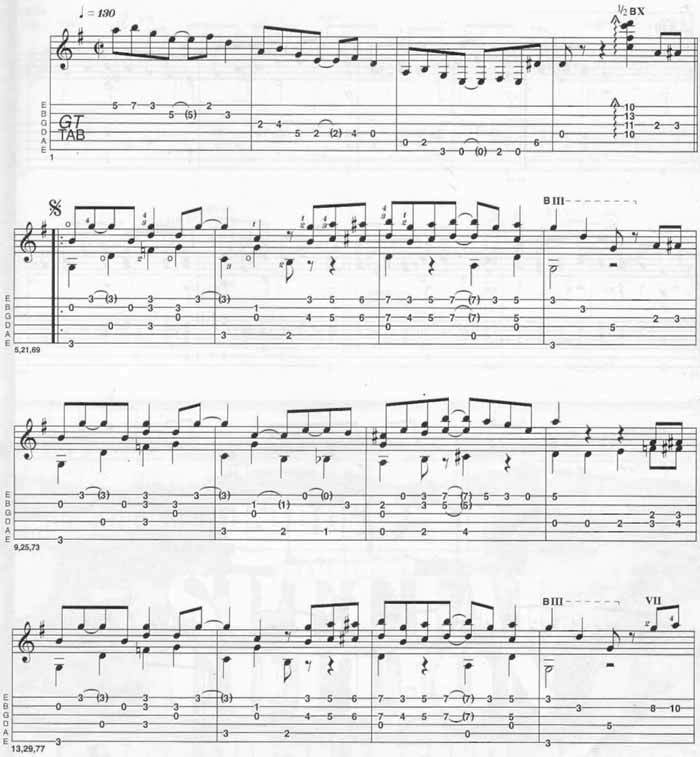 Originally in C major, I have arranged it in G major and resisted my natural urge to detune the low E string to D.
The arrangement is very accessible and has enough space in the music to enable the more advanced players among you to ‘fill in the gaps’, while being reasonably challenging for the more ‘aspiring’ guitarist. The geography of the piece is pretty straightforward: the A section is played twice, then the B section twice. Play the A section once more and then take the coda. Good luck and see you. Now, where has that capo got to…? It’s just a part of Scott Joplin The Entertainer sheet music and tab. © 2012 - 2019 TabsClub Powered by TabsClub 42 queries in 0.475 seconds.